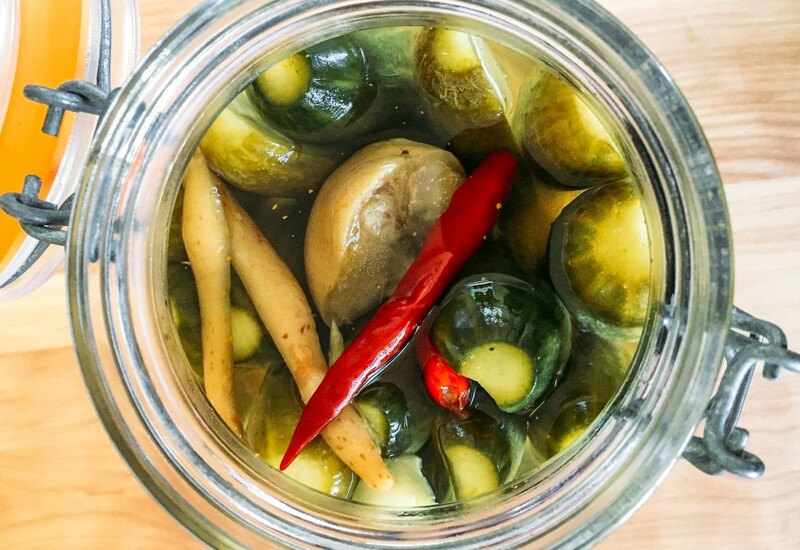 Pickles are a refreshing way to add flavor to sandwiches, salads, or your next charcuterie plate. Their bright acidity and probiotics created in the fermentation process also help with the digestion of rich foods. This spicy, super flavorful recipe infuses Persian cucumbers with flavors of preserved lemon, red chiles, galangal, and curry powder. Serve these with cheeses and cured meats on a picnic, or as a side to any grilled or roasted meats. You can find brined galangal (a close relative to ginger) at Indian markets or online. The quick pickles will keep in the refrigerator for up to six months—if they last that long! Use concentrated rice vinegar, but dilute it as directed since it is not digestible in its pure form. The pickling liquid in this recipe can be used for 2 to 3 batches. Refrigerate for up to one month. The longer the cucumbers macerate, the more pronounced the flavor will be. Per Serving: 57 calories; 0g fat; 13.6g carbohydrates; 2g protein; 0mg cholesterol; 1634mg sodium. The curry spice flavors are really good. We pickled two batches overnight. Super easy!